Pan and scan is a technique used to convert widescreen film or video footage into a conventional 4x3 aspect ratio (used by old-style television sets). Pan and scan involves a process of selecting the most important part of the frame and discarding the other parts. In this way the image width is reduced to fit the 4x3 screen dimensions. The example below shows how a shot can be cropped using pan and scan. As you can see, the two versions are quite different. This is a good example of how much the original framing is changed and how much the process is at the mercy of the pan and scan operator. This is why many film directors hate pan and scan — it can easily destroy the intended composition. 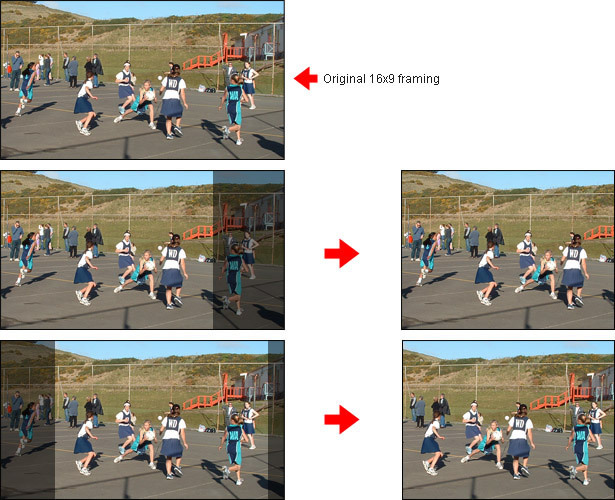 The most popular alternative to pan and scan is the letterbox format, in which the original composition is retained at the expense of placing black bars above and below the picture. Unfortunately this option is widely disliked by viewers who feel that they are somehow losing part of the image.